There's a lovely little utility called autojump for *nix consoles that makes the 'cd' command very smart. More that just auto-completion, it's a kind of "auto guessing." Hence, autojump. There is some beginning Windows support, but instead I turned to Tim Kellogg's open source PowerShell implementation "Jump-Location." First, I was like "jump-location?" I'm not going to type that. But then, of course, duh. Aliases. But there's more. It's actually watching how long you are in a directory and keeping stats. You can see the weighted stats with "jumpstat" and the "database" is just a text file in ~\jump-location.txt. If "j d" isn't enough to get me into C:\GitHub\DisProject then I can do "j g d" and I'm there. It's amazing. Installation is easy, and I hope it gets on PsGet soon for even easier installation. Just unzip, unblock, ensure that your PowerShell execution policy allows scripts, and run ./install.ps1. I'm excited about this great little utility. Head over to https://github.com/tkellogg/Jump-Location and STAR it in GitHub, and give it a go! Tim, the author, is on Twitter at @kellogh. Other contributors include Sergey Vorobyev. Didn't know about PsGet, will install first thing tomorrow. So far I've used a homemade script backed by a file containing aliases to directories and alias autocompletion, but that jump thing looks more maintenance-free. It appears that the .zip doesn't contain the necessary .dlls. Trying to build the project in VisStudio 2013 is equally problematic -- necessary nuget packages aren't updated, and even when they are, the project doesn't build. CB - I just downloaded https://sourceforge.net/projects/jumplocation/files/latest/download and the DLLs are in there. I'm getting the error that the DLL can't be loaded as well, though it is there. Oh well, not Scott's job to debug. Off to Github. I personally use Go, available on PsGet. It's not really the same thing, but it's about as useful and more predictable. Basically it's bookmarking for directories. So I'll type 'go db' to go to c:\projects\database or 'go de' for c:\users\[username]\desktop etc. I had to set up these 'bookmarks' manually but I only have maybe half a dozen and they rarely change. MR - this implies that you either didn't unblock the zip, or that PS execution policy is off. Hmm I remember using using similar a while ago, it was called Z, it has a PsGet package. Has anybody used Z before, how does it compares to AutoJump? The chocolatey install worked perfectly -- thanks Lee Harold! After running into some issues trying to install manually, I ran Lee Harold's chocolatey install and it was flawless. Thanks for that! This is great! Thanks for sharing it. And thanks Lee for making the chocolatey install. Lee, nice job with the Chocolatey package! Would you mind submitting a github issue or pull request to help automate the deployment to Chocolatey? Nice writeup Scott, and great little package Tim! 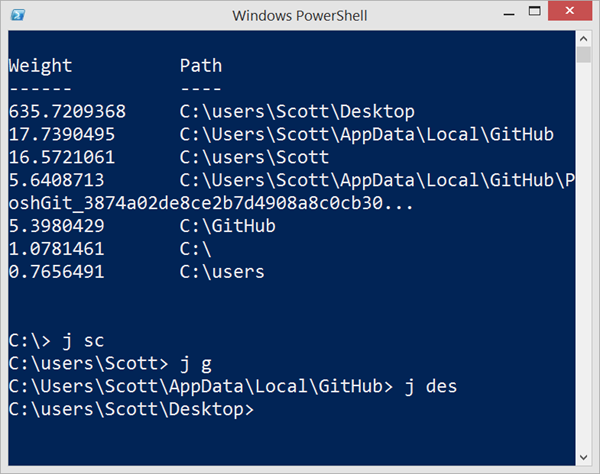 I had been using poshmarks (Powershell port of bashmarks), but Jump-Location just supplanted that in less than a full day of use. Thanks for the tip - Jump-Location is very useful for me. I ran 'cinst jump-location' and everything worked. 'j' also has tab expansion among matches! It's funny no one commented about Norton Change Directory. NCD was a nice little tool that was part of the Norton Utilities 4 (for DOS), back in 1987. I think it was the father of all these little tools that make navigating through tons of folders a breeze. Also, I think WCD (Wherever Change Directory) runs on both Windows and *nix machines. It also blows up posh-git autocompletion (which is awesome and magical and is all rainbows and unicorns), so it's out of my system, for now. I'd rather use Windows Explorer and use the "ConEmu Here" right-click integration. Note that the Chocolatey package doesn't uninstall properly and leaves the entry it created in the PS profile. Thomas, I had the same problem with posh-git. Tried a couple of things that didn't work, what did work in the end was changing the load order to ensure posh-git loads after jump-location. Just go to My Documents -> WindowsPowerShell and edit the "Microsoft.PowerShell_profile.ps1" file in a text editor. I just moved the jump-location lines to the top and restarted powershell. Hopefully that works for you too. "The term 'scaffold' is not recognized as the name of a cmdlet, function, script file, or operable program"
Our requirement is to automate T4scaffolding and generated files move to another shared folder using junkin. Thanks Tim, Scott and Lee. Mind-reading and mind-altering stuff. That is the most impressive scripting command I've ever seen, it is most inspiring. Are people using powershell rather than cmd.exe by default now? Any reason to still use cmd.exe? I really like jump-location, quite handy. I did find a bug in it. It doesn't properly handle folders with parenthesis in the name. It'll add it to the database but will throw an error when you try to use jump-location to navigate there. Maybe some day I'll find the time to fork the source and fix that but not this day.